How to play mandolin chords! Have you heard that the mandolin is one of the easiest to learn musical instruments? Learn all the major chords and finger positions for the mandolin with the application “120 Mandolin Chords», which will teach you the frets, the notes and finger positions! 120 Chords for Mandolin is suitable for both beginners and advanced players on the mandolin. You can learn the chords, create your own charts and series of chords for your favorite songs or practise. You’re right-handed or left-handed? That’s irrelevant. Just check the preferred hand in Settings and enjoy this program of learning to play the mandolin. 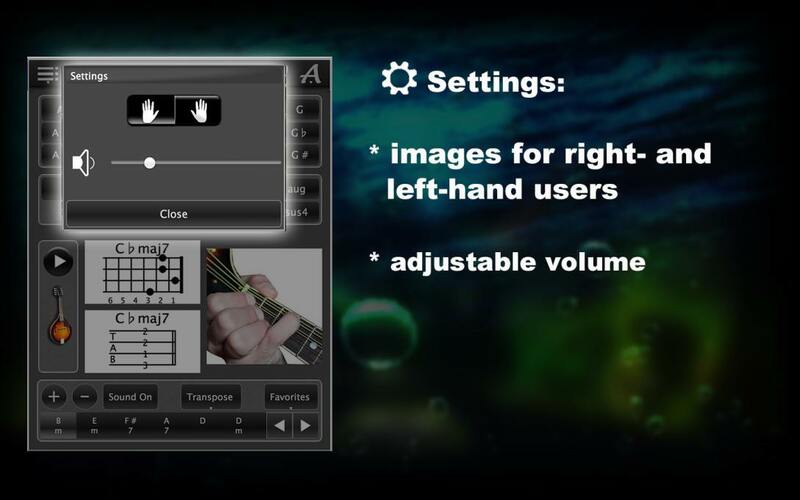 Select the note and chord type mandolin, and the app will show you the chord on the fretboard, notes and a color photo with the positions of the fingers on the fretboard of the mandolin. You can hear the real sound of the mandolin for any of the selected chords. Try different chords, learn their position on the fretboard and find out where to put your fingers. 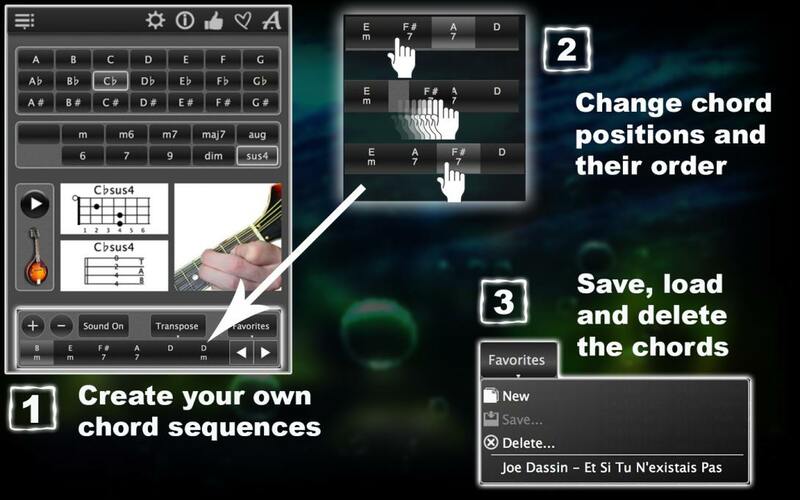 Also you can use them to create your own lessons for mandolin! You can also create personal chord progression to accompany your favorite songs and store them in the application in Favorites. Create and save as many of these progressions as you want! Or remove those that you don’t need! Change the order of the chords in each progression! 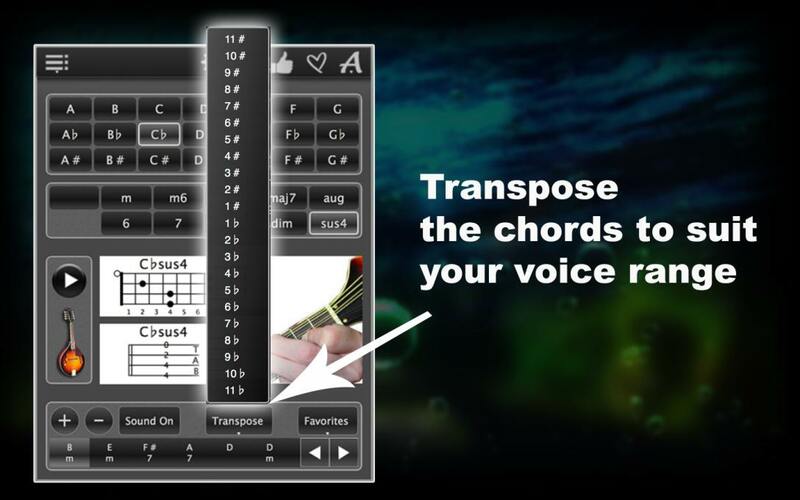 Transpose chord progressions up or down to match the range of your voice! Enjoy learning the mandolin chords with120 Chords for Mandolin! Download it now! 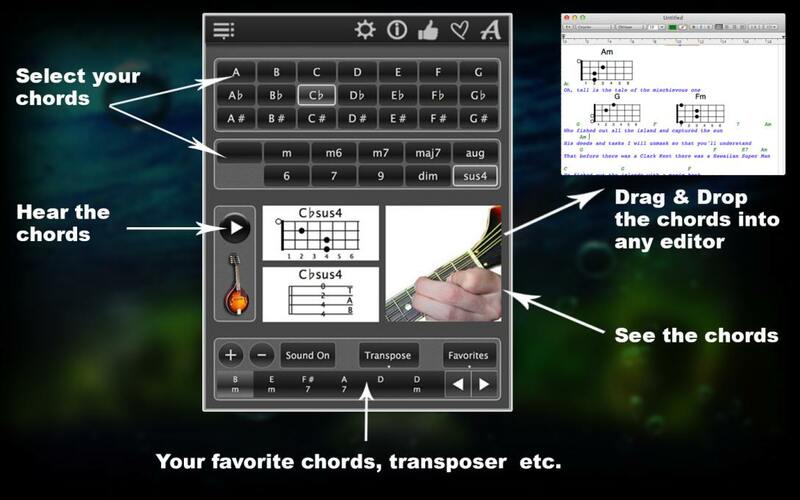 And if there is any doubt, you can try the free version of «Mandolin Chords Lite«. Welcome to the application 120 Chords for Mandolin. This app will help you find the right chords for Mandolin for your compositions, help you find them on the fretboard and create your own chord progressions. First, select a chord, note and chord type. You will see a picture of how it looks on the note sheet for Mandolin, on the fretboard, as well as where to place your fingers to play the chord. Now, let’s play it! You can also create chord progressions. Select a chord, then click on the “plus” sign. Add the following chord. Again, click on the “plus”. Continue until you get the desired sequence. You can change the order of the chords, or transpose the chords to fit your vocal range. Now, if you want to keep this sequence, click on the Favorites Save, and enter the name of your sequence!